Baby Ayr® Nose Spray/Drops (pronounced "air") loosens and thins mucus secretions to aid aspiration and removal of mucus from nose and sinuses. No irritating or stinging baby's delicate nasal membranes. Baby Ayr® Nose Spray/Drops restores vital moisture and provides soothing relief for clogged nasal passages due to colds, allergies, sinusitis, or minor nose bleeds. If area around nose is sore or tender, use Ayr® Saline Nasal Gel. 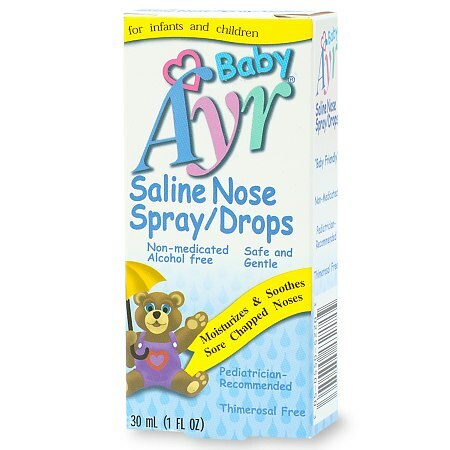 Baby Ayr® Nose Spray/Drops is non-medicated and can be used as often as needed. For Infants: Put child on his/her back with head between your knees. Gently remove excess mucus with warm, moist cloth or cotton swab. With one hand, hold the baby's hands. With your other hand, put 2 to 6 drops in each nostril, taking care not to touch the dropper tip to hands, nose or nasal secretions. Have child remain on back for 1 to 2 minutes. Gently wipe the nose with tissue or use a nasal aspirator or bulb syringe. The Ayr dropper tip should be rinsed with hot water and wiped with a clean towel. Do not use the same bottle for other children . For older children: Hold bottle upright, give short, firm squeezes into each nostril. Take care not to aspirate nasal contents back into bottle. B.F. Ascher & Company, Inc.